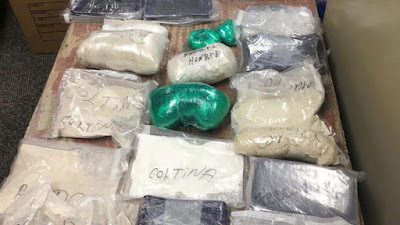 Authorities seized about 25 kilograms (over 55 pounds) of suspected heroin and fentanyl that the DEA estimates to be worth up to $7.5 million. 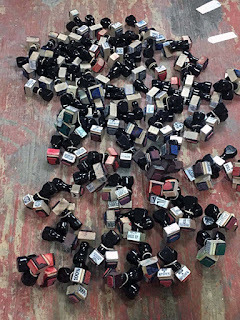 Over 100 ink stamps were seized, with names on the stamps that included, "Dexter," "Death," "UPS," "Heartless" and "Super High." Luis Guzman-Rojas, 46, Matias Rosario-Ramon, 37, Anthony Polanco, 29, Willy De La Cruz, 28, and Pedro Sandoval, 26, face charges. 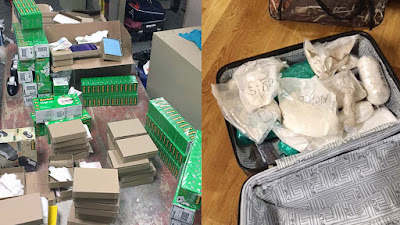 Last September over 200 pounds of Fentanyl was seized in NYC.